Poppyscotland provides life-changing support to our Armed Forces community. We reach out to those who have served, those still serving, and their families. At times of crisis and need we offer them vital practical advice, assistance and funding. Fundraising for Poppyscotland makes a real difference to our Armed Forces community. Poppyscotland is best known for running the iconic Scottish Poppy Appeal, but we work all year round to help those who have served, those still serving and their families receive the care and support they urgently need. £20 Life living rough can be frightening and lonely. As little as £20 can provide a homeless veteran with a nights accommodation, and access to re-housing services. £500 The road to recovery for an injured serviceman or woman can be long and challenging. £500 could enable them to spend a week at a specialist treatment service, so that they can receive the highest quality care and expedite their recovery. £1,000 Can fund several small home adaptations and aids that will increase a veteran’s independence and safety within their own home. To learn more watch our case studies. Make sure your school or organisation takes part in the Scottish Poppy Appeal this year. To order poppies get in touch with your local Scottish Poppy Appeal volunteer or directly through this website. Download our new fundraising leaflet for ideas on how to get involved and raise money in your school or youth organisation. Take part in the annual Scottish Poppy Appeal and sell poppies in your school. Wear all red on a non-uniform day – and encourage your friends to do the same. Organise and take part in your own school Remembrance service. At your school Remembrance service or during play time set up and run a Poppyscotland Tea & Toast event. Create a ‘How many poppies in this photo’ poster to use in school. Organise a sponsored walk to your local war memorials. Plant a remembrance garden in your school grounds using our free poppy seeds. Click here for further fundraising ideas. Please share your stories and pictures on our website and we can feature them in our learning news. 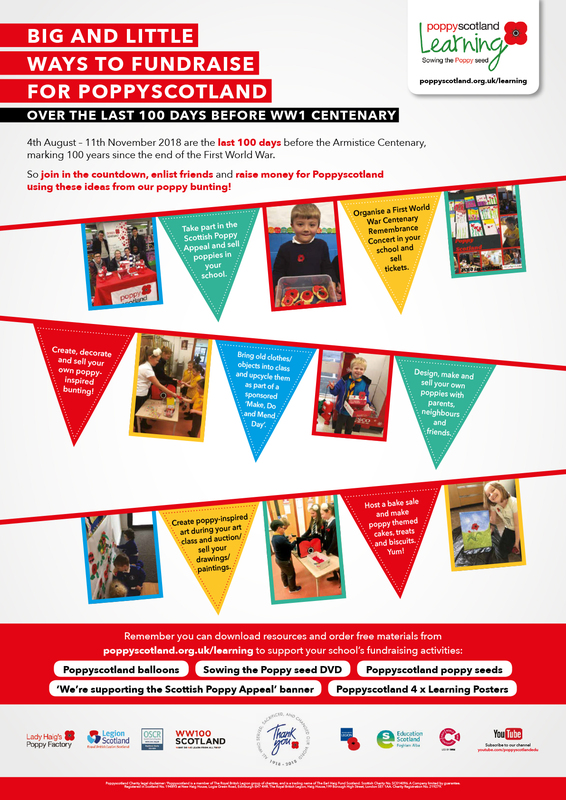 You can order free resources and materials from our Poppyscotland Learning website to support your school’s fundraising activities. Our education site has lots of resources so you can link your fundraising to Curriculum for Excellence. Money you raise can be paid directly into our bank account but please remember to tell us your school name so we can track your payment and thank you. Alternatively simply ask for a paying-in slip. Do you have a local volunteer Scottish Poppy Appeal Area Organiser? They are probably the person who delivers your poppies. You can give the money you raise to them.